This is another recipe that came about from “we have x, y, and z, how can we get rid of it?” On New Years Day we made tofu/veggie steamed dumplings from scratch. 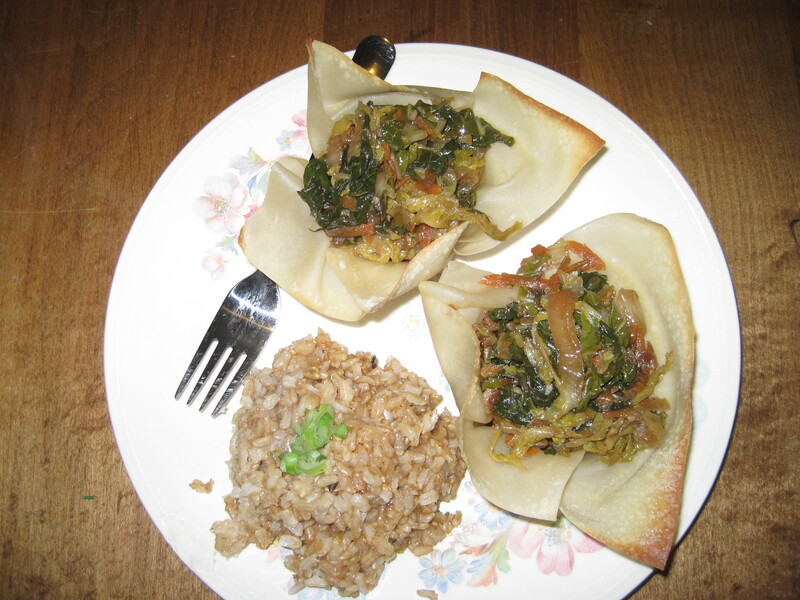 We had leftover won ton wrappers and various vegetables left over. Of the recipes that I’ve made over my many years of bad and good cooking experiences this one was slightly more labor intensive since I had to make the won ton tacos. However, on a scale of 1-10 with 5 being chocolate mousse and 10 being turducken this is only about a 2 or 3. The only complaint that I have about this dish is that it was very, very messy. Be prepared with many napkins. Alternatively, you can double layer the won ton tacos to make them slightly more rigid. Most of these amounts were approximated since many of the elements are simply things that were leftover. Preheat oven to 375F. 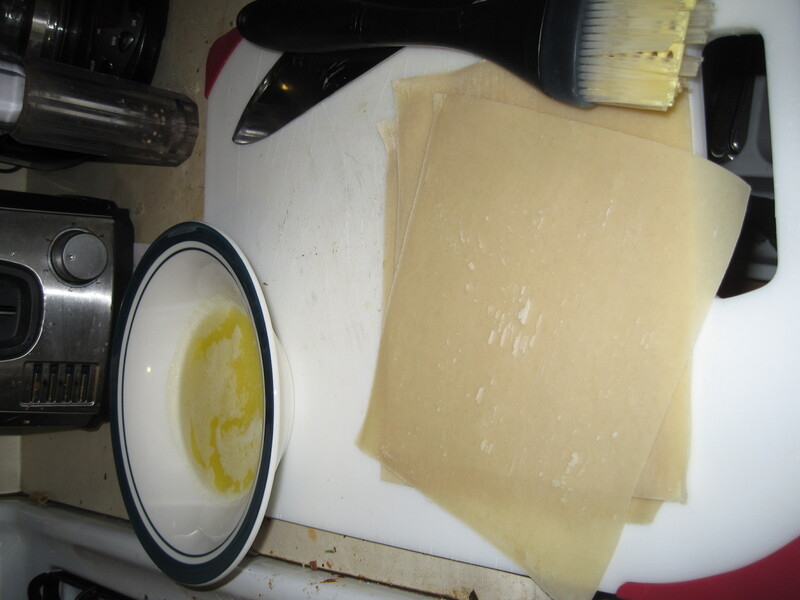 Brush melted butter onto each side of the won ton wrapper. 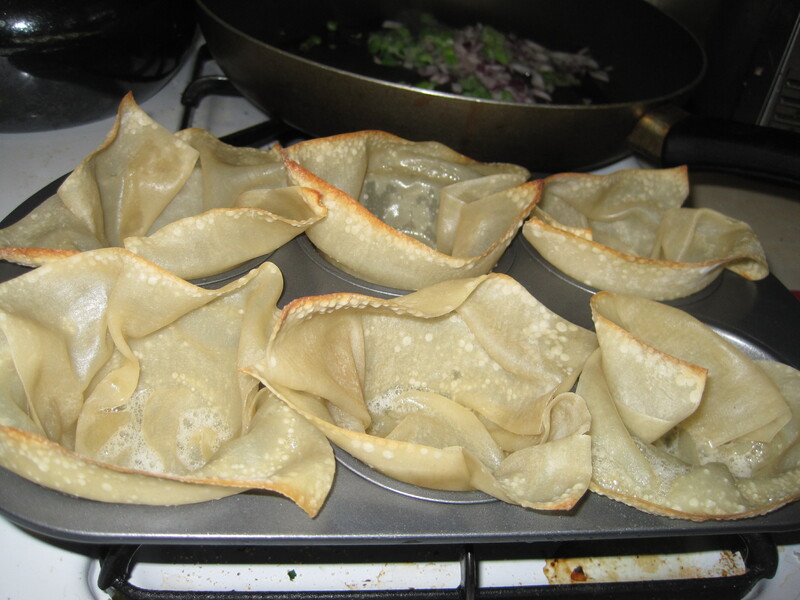 Arrange in a muffin tin so that the edges go up (this makes somewhat of a mini-won ton taco bowl). Bake in oven for approximately 1-3 minutes or until golden brown. Let cool for about 30-45 minutes. 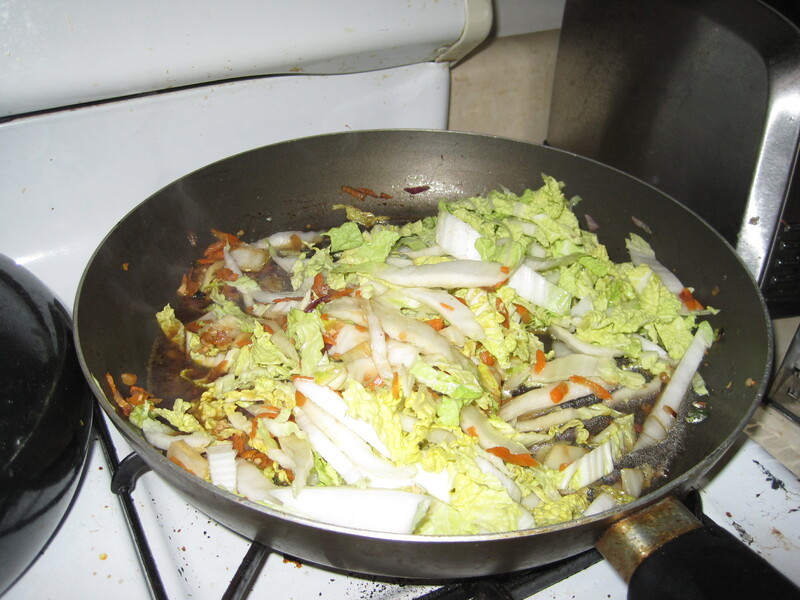 Add vegetable oil, sesame oil, garlic, onion, and scallions into a large saute pan. Saute until onions are slightly soft making sure that the garlic does not burn. 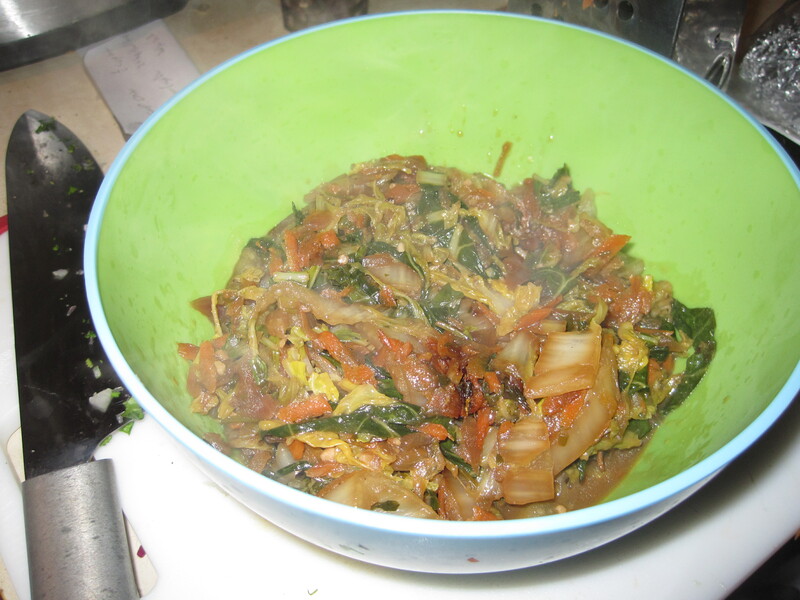 Add cabbage and carrots. Saute for a minute of so and add water and soy sauce. Cover to steam for about 15 minutes or until cabbage is soft. Add cilantro and Asian sesame dressing and simmer for another 10-15 minutes. Add Bok Choy in and cook for about 5 minutes. Remove from heat and keep covered to ensure that Bok Choy is cooked. Let mixture cool slightly and put in another bowl. Set aside to serve lukewarm. Heat vegetable oil, sesame oil, and soy sauce. Add soy crumbles (you may need to defrost them before adding them). Cook until liquid is well absorbed into soy crumbles (you may need to add water to mixture to make sure that the soy crumbles do not stick to pan). When well absorbed, add dressing and cook for an additional 5 minutes or so until the dressing reduces down. 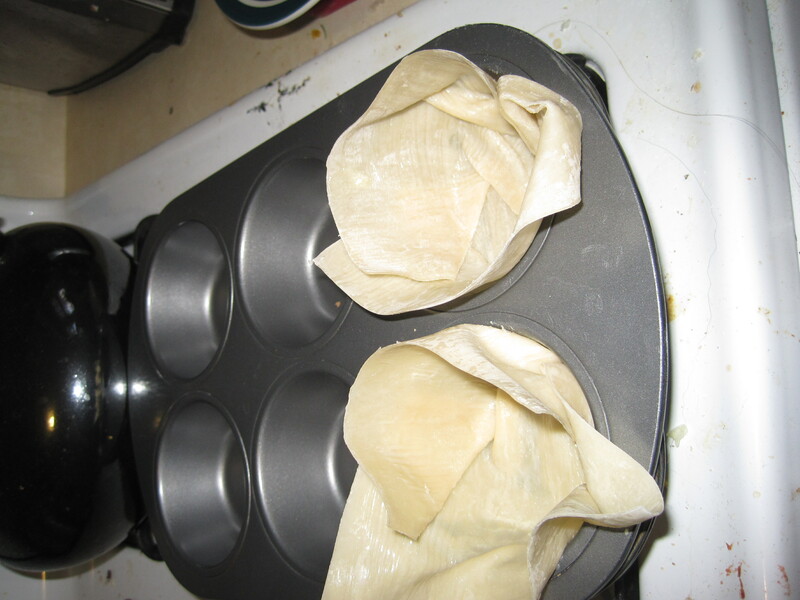 To serve, take won ton taco out of muffin pan. Layer beef on the bottom and add vegetable mixture on top. Serve with rice.